The Buffalo Sabres almost had to win Friday night’s game against the Edmonton Oilers at the KeyBank Center. They hadn’t won a game in 17 days, going 0-5-2 in their last seven starts. Wednesday’s loss started a rash of introspection that would have kept a team of psychologists busy. They had lost the first three games of a four-game homestand. The Sabres don’t play four in a row during a season that often, but they hadn’t lost all four in regulation in that situation since December, 2003. And they were playing an Oilers team that ranked as one of the biggest disappointments of the young season, had lost five of seven, and were in the midst of a five-game road trip. Mission accomplished. Buffalo won’t be running up any more therapy bills in the immediate future after a 3-1 win before a sellout crowd. Buffalo did earn the chance to exhale and smile after this one, and worked hard enough to give it an opportunity to win. The game’s first goal, which was something of a turning point, was an example of that. It came at 14:16 of the second period of a scoreless contest. Kyle Okposo made a nifty pass to Jacob Josefson, who made a big-time shot from the shot for his first goal as a Sabre. That line has combined for three goals in two games. Perhaps more importantly, the Sabres had applied consistent pressure in the previous two shifts before the goal. Most of the players mentioned how that can wear a team down, and it was a stretch that hasn’t been seen often enough lately. Buffalo picked up a second goal in the first minute of the third period. Eichel threw a puck after skating down the right side, and it went in against Laurent Brossoit. Sometimes that happens. Okposo added an empty-netter, which was followed by an Oilers’ goal by Yohann Auvitu with 20 seconds left. That spoiled the shutout by Robin Lehner, but not the good feelings. 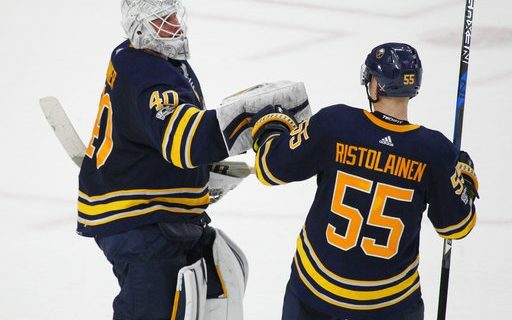 The Sabres obviously received a boost from the return of Rasmus Ristolainen from the injured list. He played 27 minutes and helped keep Connor McDavid at least in control. “I usually never get to rest that long during the season, so I felt really fresh,” Ristolainen said. As for McDavid, the league’s top young player made a couple of moves that generated some oohs from the crowd, but for the most part the Buffalo team was aware of when he was on the ice and didn’t give him too much space to operate. Then again, Edmonton did little to suggest a turnaround in fortunes was coming for it anytime soon. They’ll try to match their longest winning streak of the season – two games, done once – on Saturday night when they play the Canadiens in Montreal. Tampa Bay comes to the KeyBank Center on Tuesday night.